What is the most popular or commonly used plastic corrugated container? I am going to assume that you are asking the most popular Style or Design type. There are a few different products that have been sold in the millions over the years. One of the most used and popular plastic corrugated items would be the plastic corrugated U.S. Postal Nestable Tote design. There are several million U.S. Postal Totes that have been purchased and put in to use over the past two decades. Not only has the U.S. Postal Service used these huge quantities but we have sold these same plastic corrugated nestable totes to large variety of industries. They are now in use in industries like Cosmetics, Laboratories, Automotive, Distribution, Warehousing, Farming. As well as Parts Manufacturing, and Clothing Manufacturing just to name a few. We had one customer in the automotive industry that was replacing their heavy double-wall Paper Corrugated totes 4 times a year. After changing over to our Plastic Corrugated nestable totes they were able to use their new totes for over 10 years! The nestable design allows for the totes to be stacked in to each other to save on storage space when not in use and they are reinforced by a metal wire frame for strength and durability. We even have a special design that allows for both stacking and nesting with the flip of a few wires. 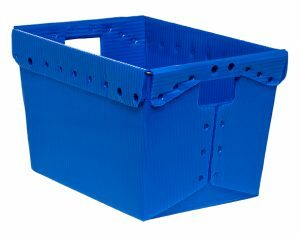 Probably the most used box design in plastic corrugated would be the Distribution Style Box. This is a very popular and versatile box as it has a self-closing and locking bottom and it does not require any taping or closures on the top to hold the top flaps shut thanks to a flap lock design that retains the top flaps after filling the container. Another great feature is it folds flat for storage and can be used repeatedly. We have customers that have used this box for well over 100 uses to their stores and back to their distribution centers for reuse and return. 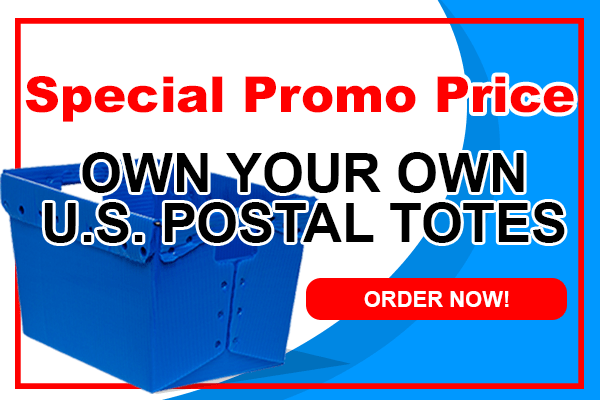 This box is not just used for Distribution as we have customers in a wide variety of industries taking advantage of this design and millions have been sold and are in use. 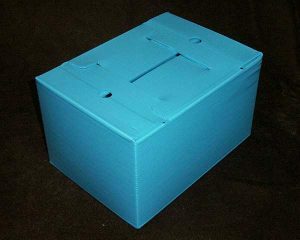 Our most widely used Large Plastic Corrugated Container is our PPS Pallet-Pak. 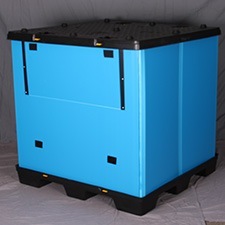 This is a full-size pallet container that folds down for return shipment and storage saving on warehouse and trailer space. This is also the lightest pallet size container available. It can be customized to many different sizes and can be manufactured with or without drop doors. Our self-locking pallet and cap can allow the customer to ship their product. This is without the use of straps, stretch wrap or belts. These PPS Pallet-Paks are in use protecting fine art at The Smithsonian Museums to Auto Parts shipping and containment. This is another product that has been sold in the millions and is in use in almost every industry imaginable.